This is the best method we’ve come across as pot and pan cleaner when hot water, soap, and a little elbow-grease won’t do the trick. It tackles the baked-on residue that seems resistant to other natural and chemical cleaners.It’s our experience that a little elbow-grease still is needed, but not as much as with other cleaners and it works like a champ. 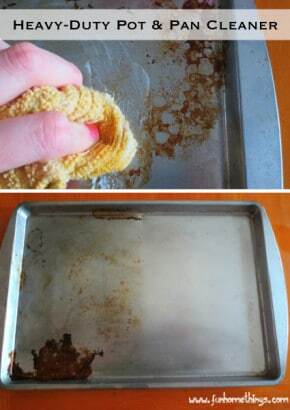 So, if you have pot and pans with baked on food and oil, make then look clean and new again with simple DIY cleaners. You’ll be glad you did!